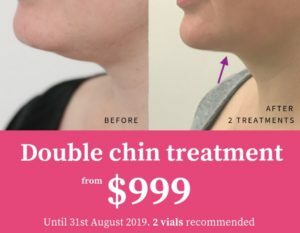 Home > Questions > Double chin injections – How many treatments do I need to achieve the full effect? Double chin injections – How many treatments do I need to achieve the full effect? This can be a tricky question to give an exact answer. Everyone is different, and have different size submental fat areas. Someone with a smaller pocket in this area would normally need less treatments than someone with a large pocket. In saying that, I normally give my patients a guide to have a minimum of two treatments, to see ‘some’ result. These treatments are to be done no sooner than one month apart and some people may require 3, 4, or even 5 treatments, depending on the size of the area, and how much needs treating.